I’m just going to put this out there: I love Tinkerbell. I know it’s intended for 5 year olds, and I’m 24, but who cares? Neverland is a place of magic, friendship and adventure, and I am powerless against that. Something I’ve always adored about Tink, though, is her style; one of the first things she does is whip up a dress and make the Tinkerbell slippers we all know and love. 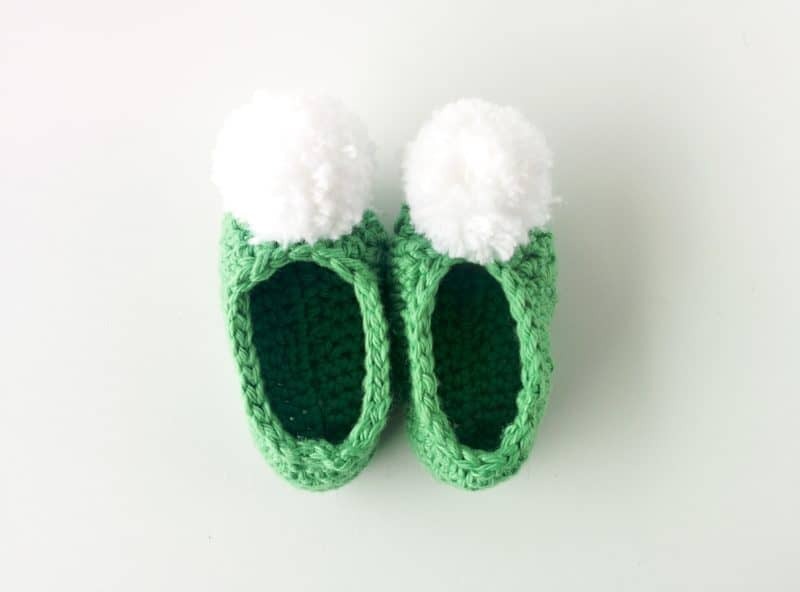 Nothing says Spring to me more than Tinkerbell, so these little Tinkerbell slippers couldn’t come at a better time. 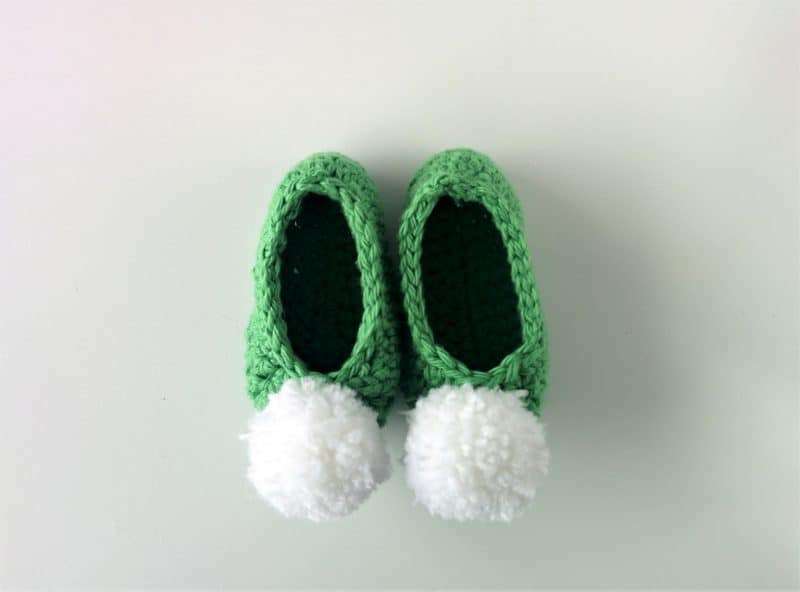 They are super simple to make and, because I used the sole pattern created by Bethany over at Whistle and Ivy, they come in sizes from 0-12 months old! 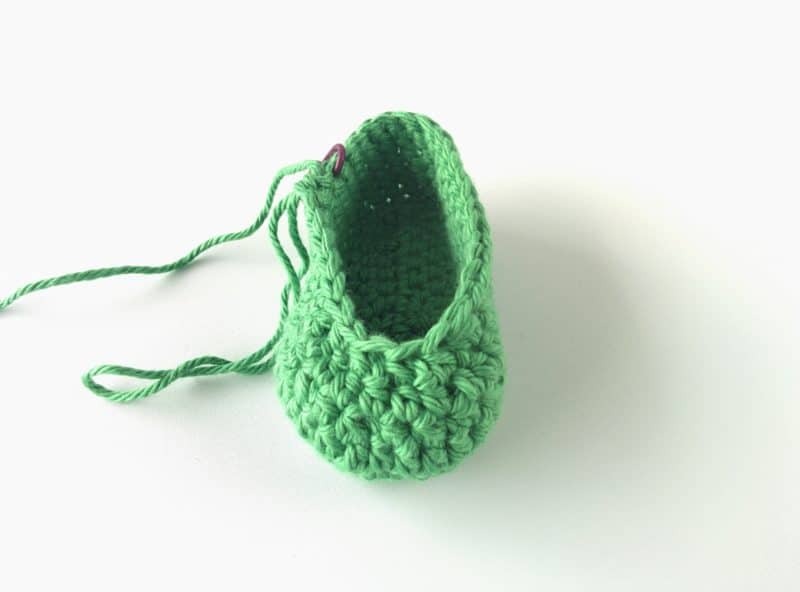 Keep reading to see how you can crochet a pair of these precious little slippers in no time. 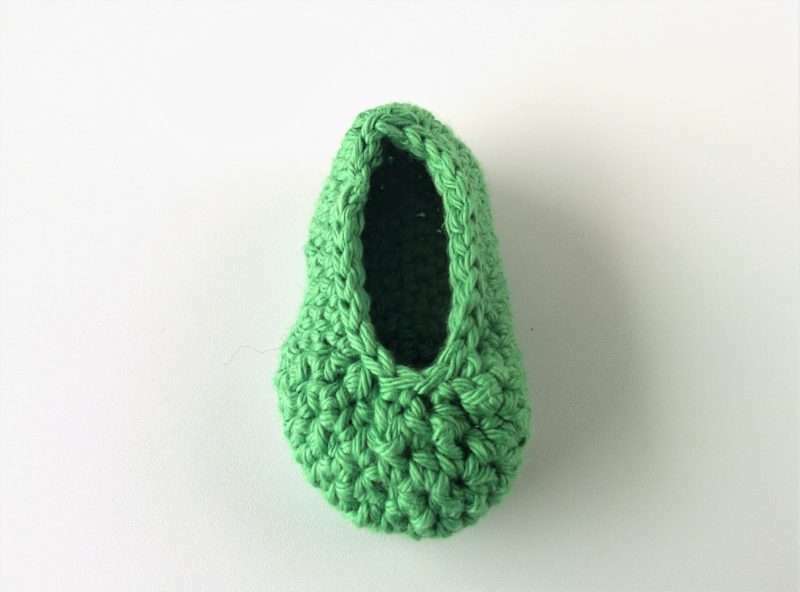 For the sole, I used Bethany’s Basic Baby Sole Pattern. I usually just wing soles and make sure they’re the right size, but they always turn out a little different each time. With this pattern, it’s simple and straightforward, and you get the same result each time. 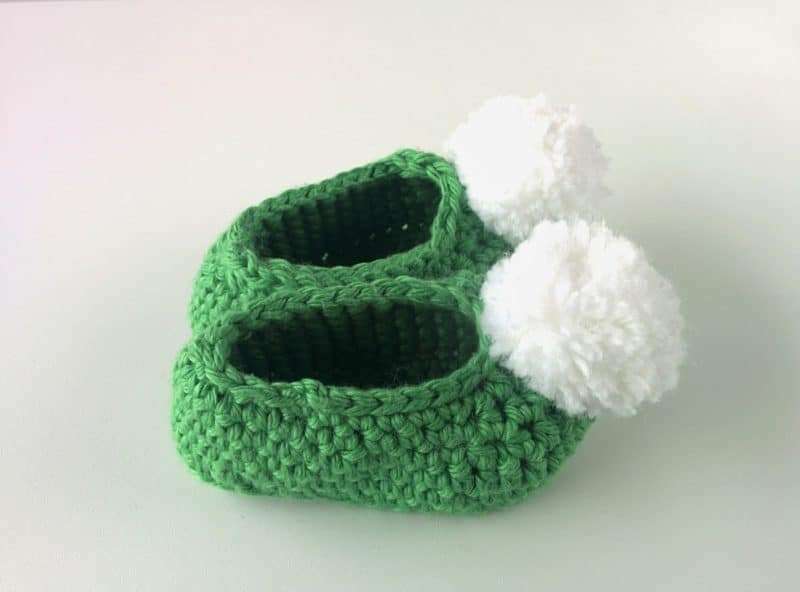 Bethany’s also sized them really well, so that even as the size increases, you can use the same pattern for the top of the bootie without changing anything. I’ll show you what I mean in a minute. 1. 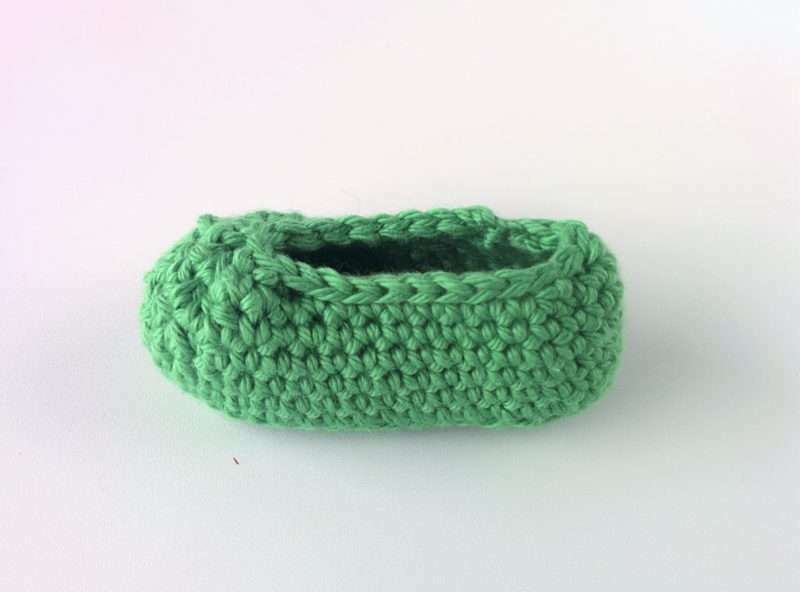 First follow the sole pattern for the size you want to make. 2. Then, working in back loops only, SC round for 1 round. 3. SC around normally for 1 round (2 rounds for 9-12 month size). 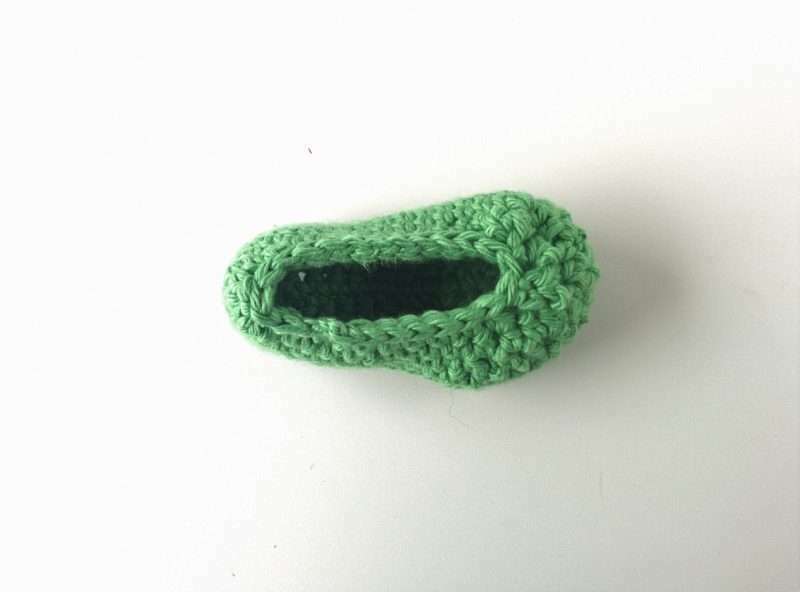 You’ll notice the edge will turn upwards and separate the sole from the rest of the slipper. For the next round, the first # is the 0-3 months size, and the #s in the parentheses are for the larger sizes. 4. SC 16 (18, 19, 20). HDC into each of the next 15 stitches. SC 7 (9, 10, 11) until the end of the round. 5. SC 16 (18, 19, 20). *HDC, decrease*, 5 times . SC 7 (9, 10, 11) until the end of the round. 6. SC 16 (18, 19, 20). HDC into each of the next 10 stitches. SC 7 (9, 10, 11) until the end of the round. 7. SC 16 (18, 19, 20). Decrease 5 times. SC 7 (9, 10, 11) until the end of the round. 8. *Skip 1 space and slip stitch into the next* 3 times. This brings the heel in a little bit and starts our trim. 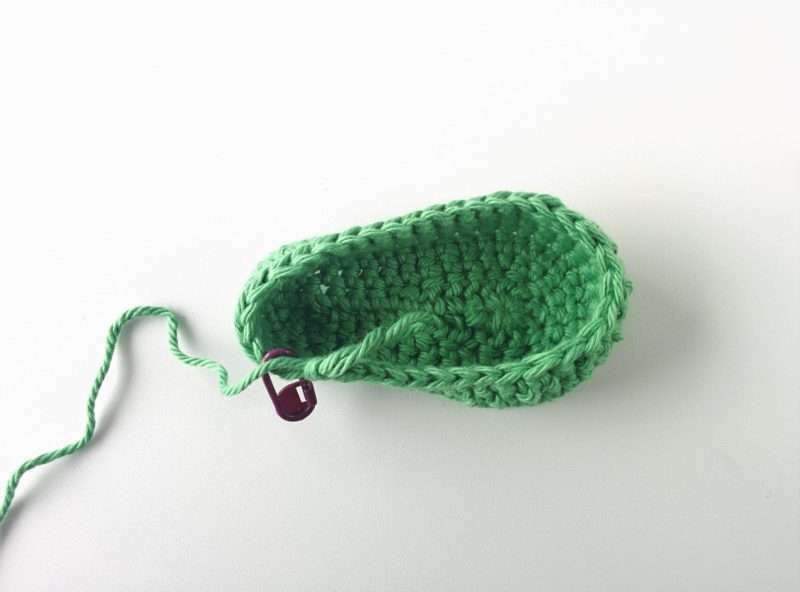 Slip stitch 15 (17,18,19). Then, *skip 1 space and slip stitch into the next* 3 times. This brings the top of the toe in a little bit. 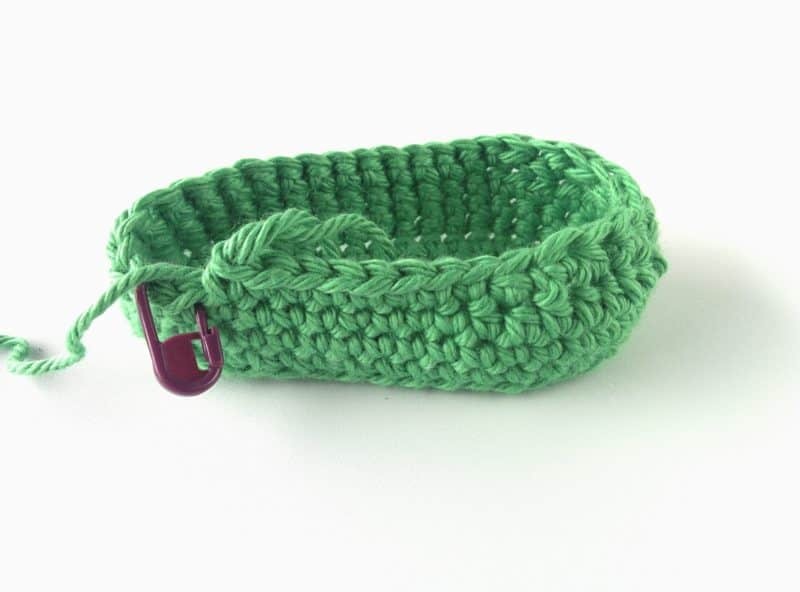 Slip stitch to the end of the round and bind off. 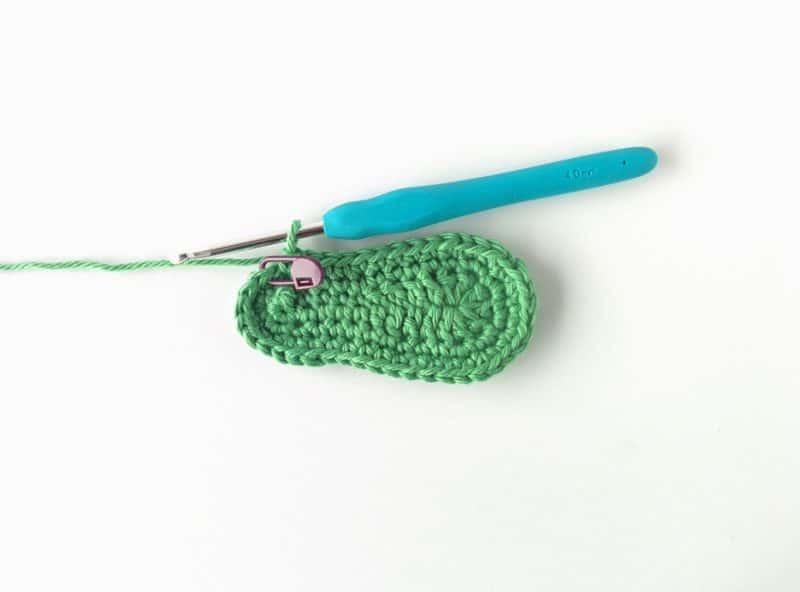 Use a tapestry needle to weave in any loose ends. 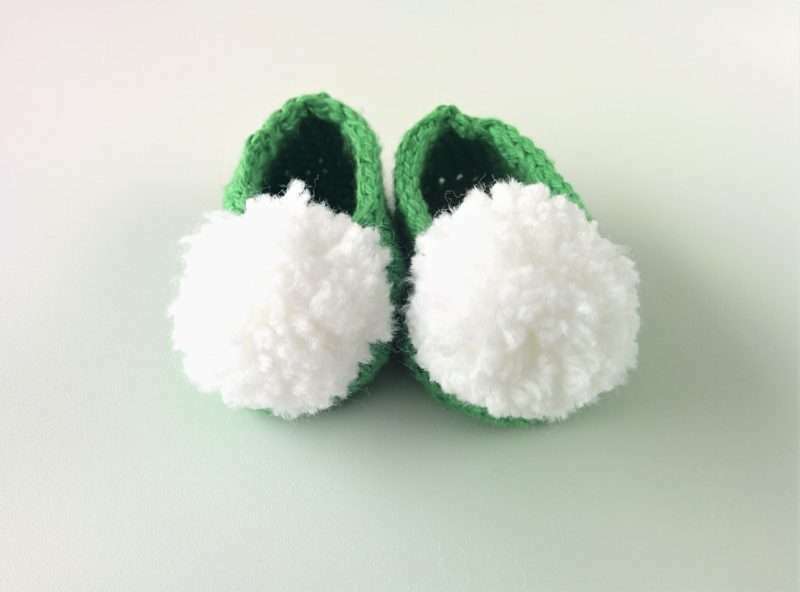 Now, use your little pompom maker, or your favorite method to make pompoms, and make the 2 white poms to go on the booties. 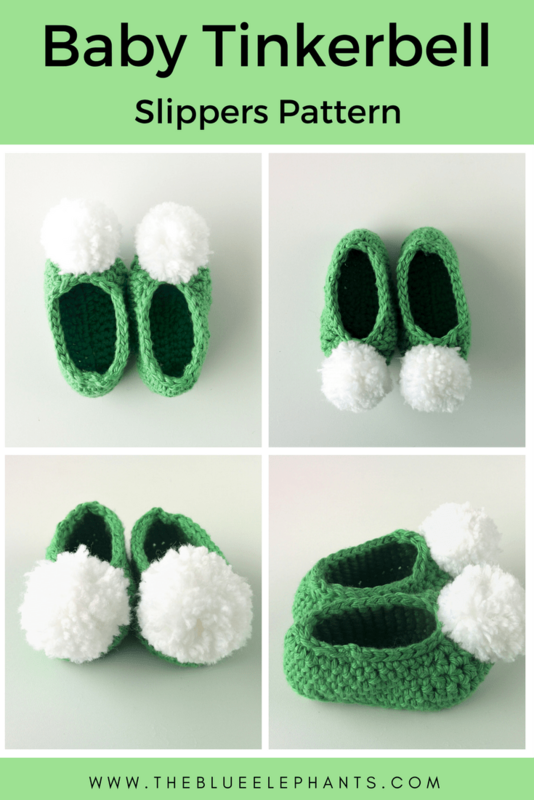 Leave a long tail and then you can use the tail to sew the poms to the top of the toes. 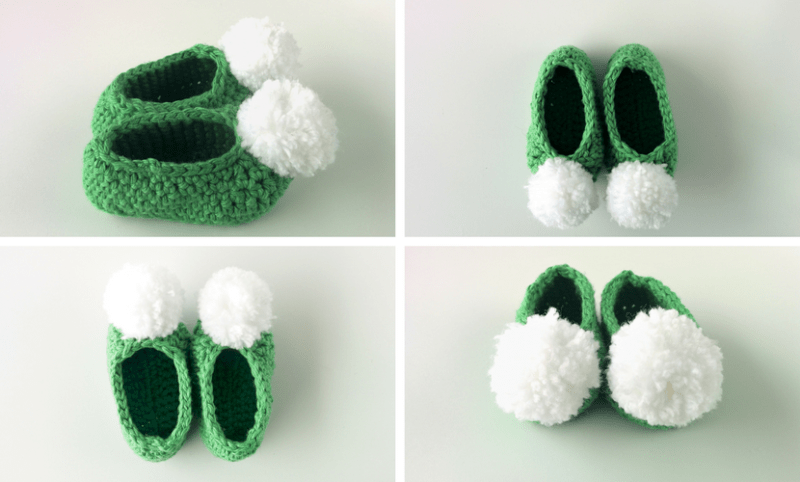 This takes them from cute, simple booties to Tinkerbell slippers! This was a fun little project for me, because even though it isn’t very fancy or elaborate, it’s pretty and it makes me happy. I think sometimes we get caught up with big projects that eat up our time and energy, and I’m so guilty of this. I like taking on challenges and working on multiple big projects at once, but it’s also nice to do something easy. These can be made in less than an hour and they make me so happy to look at. 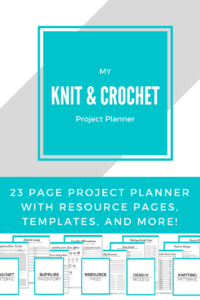 I encourage you to put down stressful projects for a day, and instead work on something light and fun. That’s all for this week, but I will see you guys soon with a new post! 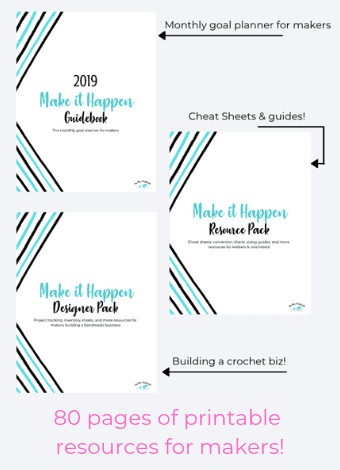 Be sure to subscribe down below to get access to the resource library where you can get subscriber only bonuses like my ebook, The Beginner’s Guide to Crochet. You can also get The Ultimate Guide to Sizing Hats and be 100% sure of a hat size, every single time. You’ll also be signed up for the weekly newsletters so you’re always in the loop! Hello being from the UK in translating this pattern into UK terms. 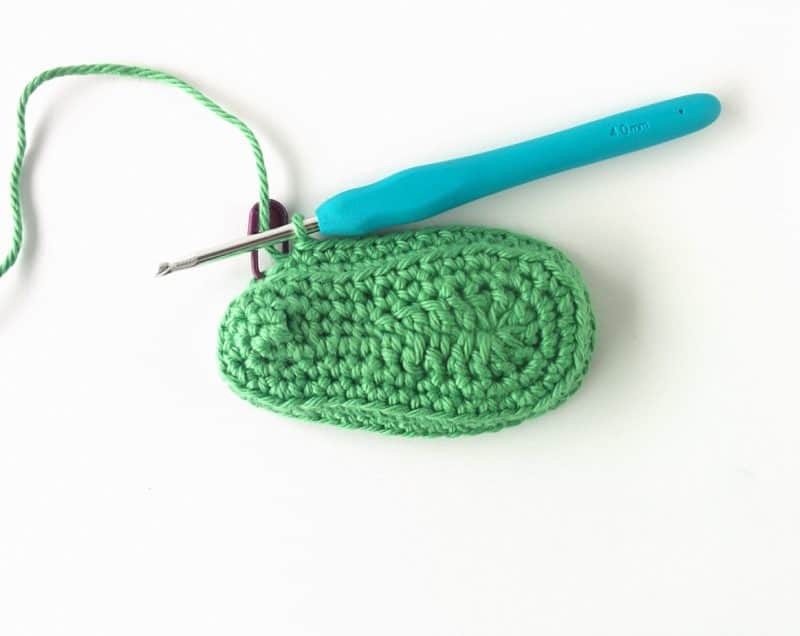 In step 7 where you say “decrease 5 times” So you mean SC decrease 5 times which would be Double Crochet Decrease 5 times in the UK? It has the abbreviations and what to replace for UK terms. Hope that helps you!